What started out as a relaxing past-time gradually became a full blown avocation. What was enjoyable and cathartic became a serious endeavor. And as I got better at it and more confident in sharing my work it became a profession. Today I paint for personal enjoyment, engagement with other people and income. I love the smell of paint, the excitement of working with color and a deepening and joyful appreciation of the stunning beauty of the physical world and all that's in it. Oil painting is an opportunity for life-long learning and creativity. I can easily see myself as an old man sitting on a stool in the woods, breathing in the air, listening to the sounds of nature and immersing myself in light and color. Desire is the only prerequisite for oil painting. People think they need to know how to draw or have some background in art. Not true. Perhaps the best analogy I can offer is that learning to paint is like learning anything. We learned to speak a language, we learned to read, we learned to drive a car, we learned to operate a computer, etc. Oil painting is no different. We begin simply, painting squares and circles with color. We learn first to see the color that’s out there and then to put that color on a canvas board within shapes. Pretty basic. We learn that we are not painting objects; we are painting light. Our eyes don’t see blocks or balls or trees or the sky. They see the light that’s projected or reflected off these things. Light that has presence, speed, energy and carries all the colors present in the environment. Coming to know this changes the way we see and experience the world around us in every facet of our daily lives. Oil painting expands our minds and deepens our joy of living. Explore the videos in the right column which cover these topics. Linseed oil to clean and condition wood surface of palette and to mix with certain paints. We also need oil paint. Artists have their favorite brand of oil paint and palette of paints (array of colors). What we use in my classes lends itself to the full color experience of impressionist painting. I ask my students to approach painting with a full palette of paint, even if they think they may not use all of them. I believe having a full array of colors available helps us think more fully about the colors in the scene and makes for better painting. You can view the full list of colors I provide to my students. If you are interested in purchasing your own supplies you can view the recommended supply list. For most of history oil painters usually did their work in studios. Grinding minerals to create pigment and mixing this with linseed oil was a daily chore, carried out mostly by assistants in a laboratory connected to the painter’s studio. Light came through windows or candles/lamps. This changed in the mid 1800’s when the French Impressionists popularized plein air (outdoor) painting. Today, with modern portable paints artists have the option to paint indoors or outdoors. We use the studio for most regular classes. This allows us to work regardless of weather and permits a controlled environment for students who are learning the basics of painting or working on projects from pictures. Painting in the open air, or en plein air has become a popular and fulfilling experience for more and more artists. Full or half day workshops take place en plein air, weather permitting. Outdoor painting is a very different experience from studio painting and calls for lots of planning and a willingness to engage nature “full on”. It can also be a deeply enjoyable and rewarding experience. From an impressionist point of view, plein air is where we truly encounter light and its effect on color. Plein air is my preferred mode of painting. In our plein air work at Swanquarterart Studio the planning is simplified because all the materials are provided onsite. Some student preparation is still required, however. Please review my planning list. This is a resource for purchasing equipment and supplies for Plein Air Painting. There are other sites on the internet, but this seems to be a good place to start and summary of what it takes to get ready to go out when you have to supply everything yourself. First there’s the Void (empty canvas); God created the heavens and the earth (draw a horizon line). God created light and separated the light from the darkness, creating the sky; (identify your major shapes as light planes and shadow planes – the sky is always the lightest shape). remember the light? We paint light. Without it our eyes see nothing. God separated the earth and the water above and below; (draw large shapes within the major divisions and make their color and value right relative to each other). God created lights in the sky and plants in the land; (paint smaller shapes within the larger shapes, giving them distinctive color and value within the large shapes). God created creatures to populate the land; (paint details within the small shapes). God created man; (resolve the edges and paint the highlights). Done. Sip some wine and say the words: “it is good”. The painting process is much more detailed, of course, but it’s important to remember that it is a structured, logical process. Take a minute to review a summary of the Color Study Steps I developed based on the Hensche Color Study. See the section below on the Hensche Color Study. 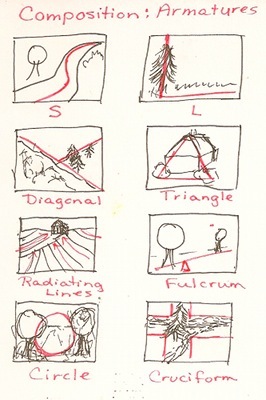 One of the more interesting aspects of creating art is learning about the elements of composition. We live in a beautiful visual world. Some visual experiences, however, are more exciting or inspiring than others. Why? What is it that makes this particular scene so wonderfully enjoyable and another one unpleasant or anxiety producing? Why does one painting make people say, “I love it!” and another painting elicit indifference or annoyance, even though we put the same amount of skill and effort into both? Well, I would say it this way: there’s a fundamental order to the universe that connects everything together. When that order is expressed in a scene before us, there is a subliminal wave of recognition inside us that perks up and gushes joyfully. We experience connectedness, a sense of belonging, some deep assurance that we are in the right place. Think of the pantheon in Athens. The ancient temple to the goddess Venus. Greek architects used something called the “golden ratio” to construct its rectangular shape. As we view this structure from a distance we get “that feeling”. The golden ratio (1:1.61803399) was used to measure the height to the width of the structure. This ratio, in some primordial way, expresses the armature that undergirds the universe and makes us feel “connected”. A related phenomenon is the Fibonacci Sequence, which can be found all over in nature. Explore both the Golden Ratio and the Fibonacci Sequence. Here is an interesting video introducing the Fibonacci Sequence. Beautiful composition expresses these principles. An attractive arrangement of shapes in a painting contains an “armature” that corresponds to this universal structure of creation. This series of videos provides a comprehensive review of composition for artists. Below are some links about composition you might want to explore. The Helpful Art Teacher is another site with lots of information about composition and balance in a painting. This is a site with some neat stuff to help you with composition and drawing. Most people don’t see color. We simply categorize the world around us according to a color script we learned as children. Sky is blue. Trees are green. Dirt is brown. Snow is white. Roads are grey. Fire engines are red. The sun is yellow. We acknowledge color only to the extent needed to communicate what is necessary to create a visual picture for someone. Perhaps the most useful resource for learning the Hensche color approach is a manual called " Colour Study", written by Tommy Thurmond, one of Hensche's students. This manual is a non commercial resource made available for the purpose of assisting individuals learning the Hensche color study process. It may not be sold commercially. I highly recommend it to my students. Download your copy of the Hensche Color Study. You can be a part of the Impressionist painting world! If you are interested in experiencing a world of color and enjoying the adventure of painting outdoors this is the opportunity for you. See my class schedule here. Contact me for more information. Camille Przewodek is a Hensche student who now offers workshops around the country on the Hensche approach to painting color. This is an introductory video she offers. Brief introduction to a longer video on Susan Sarback's four step method. Susan Sarback is a Hensche student who has founded her own school of instruction. She has also published a book on color painting. A quick overview of painting a white block in sunlight. John Ebersberger is a Hensche student who has a teaching studio in Annapolis, MD and offers a range of painting workshops and classes. You can see his website at the bottom of the Painting Resources page of this website. Block study created on an ipad. Painting a Color Block Study is a fun and engaging way to learn to see and create color. Enjoy this one. John Ebersberger demonstrates outdoor still life painting. Intgeresting discussion. John Ebersberger demonstrates outdoor still life painting. Continuing the discussion from the previous video. John Ebersberger demonstrates the "mud head". This is a simple, basic approach to rendering the silouette of the human head and shoulders in sunlight. Another form of studying the effect of light on color. In this case, it's the color of the face, neck and shoulders. John Ebersberger demonstrates the process for portrait painting using the Hensche approach. Cedric Egelias is a master portrait artist and a student of Henry Hensche. This is a demo from one of his winter workshops in Annapolis MD. Enjoy. Beautiful Experience of a Morning Landscape Painting Session. John Clayton is a Hensche student here demonstrating a morning painting experience in Provincetown, MA. Included here just for the enjoyment. John Clayton talks about portrait drawing. He provides some interesting insights into the head and features. Hilda Neily is a student of Henry Hensche and a beautiful artist. Enjoy a gallery of her paintings put to music.